MEGA64 PODCAST 232 IS UP!! THANK YOU KOBEY'S!! 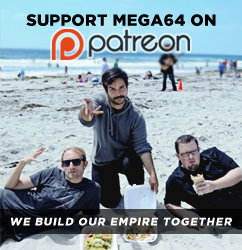 The newest Mega64 Podcast (Episode 232) is finally up! In this brave and bold new episode, we talk about the making of our "Chin Down, Eyes Up" video, chat a bit about PAX, and make a Gamedays 2012 announcement of galactic proportions. It has to be seen to be believed! Or heard. Watch below or listen to the audio version here. If the audio seems a bit strange this week, it is- Our audio equipment for the recorded version went haywire, so we were forced to use audio from last Sunday's live stream. Hopefully you still find it listenable! Our Fallout 3 video has gone over really well. We've seen it linked on a ton of different sites- Thanks to anyone who passed the video around! We wanted to take the time, though, to especially thank one of the places that we filmed the skit at- Kobey's Swap Meet in San Diego. We have gone to this swap meet for shopping our entire lives, and have found more random props and old video games there than you would ever believe. We filmed a couple past skits there (Assassin's Creed, Uncharted 3, etc. ), and even did some shopping during the filming! Well, the guys behind the swap meet got wise to our antics, but instead of telling us to get lost, they were actually really welcoming to us filming another skit there. We filmed Fallout there and it couldn't have gone better. They even have their own Youtube channel! Be sure to go there some weekend you're in San Diego- great deals and a nice staff. They didn't ask us to post this or anything; We just couldn't resist writing about where Eric has gotten over 100 luchador masks for pennies on the dollar. We'll have some more fun stuff later this week. Stick around.